Behold the cormorant: silent, still, cruciform, and brooding; flashing, soaring, quick as a snake. Evolution has crafted the only creature on Earth that can migrate the length of a continent, dive and hunt deep underwater, perch comfortably on a branch or a wire, walk on land, climb up cliff faces, feed on thousands of different species, and live beside both fresh and salt water in a vast global range of temperatures and altitudes, often in close proximity to man. Long a symbol of gluttony, greed, bad luck, and evil, the cormorant has led a troubled existence in human history, myth, and literature. The birds have been prized as a source of mineral wealth in Peru, hunted to extinction in the Arctic, trained by the Japanese to catch fish, demonized by Milton in Paradise Lost, and reviled, despised, and exterminated by sport and commercial fishermen from Israel to Indianapolis, Toronto to Tierra del Fuego. 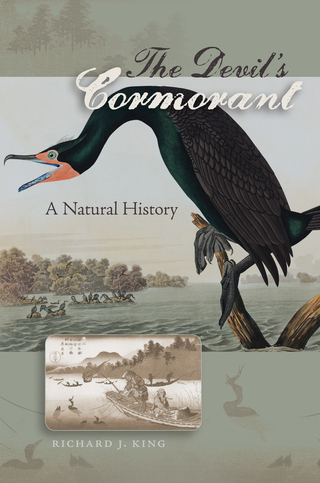 In The Devil’s Cormorant, Richard King takes us back in time and around the world to show us the history, nature, ecology, and economy of the world’s most misunderstood waterfowl. "Richard King has a rare knack for seeing the large in the little, showing how a rather obscure bird or a humble shellfish actually looms large in the lives of men and women. He writes comfortably, with all the authority but absolutely none of the pretense of a leading scientific expert (though he is). He invites you, then lets you see. The Devil’s Cormorant is about a misunderstood bird whose value has been appreciated by few, intentionally ignored by some, and overlooked by most. This book is his gift to us. "—Carl Safina, author of Song for the Blue Ocean and The View From Lazy Point. "Richard King’s The Devil’s Cormorant explores the complex, centuries-long relationship between humans and cormorants. What is it about these bizarre, prehistoric-looking birds that evokes such powerful feelings of hatred—and love? Viewed as trash birds in need of extermination by many people and sacred partners in the hunt by others, cormorants have rarely been looked at in an appreciative way, as one of the most fascinating groups of birds in the world. King puts a face on the cormorants as well as on the people who love them and those who would exterminate them. I felt at best ambivalent about cormorants before reading this book; I’ll never view these birds the same again." — Tim Gallagher, author of The Grail Bird and editor-in-chief of Living Bird magazine.